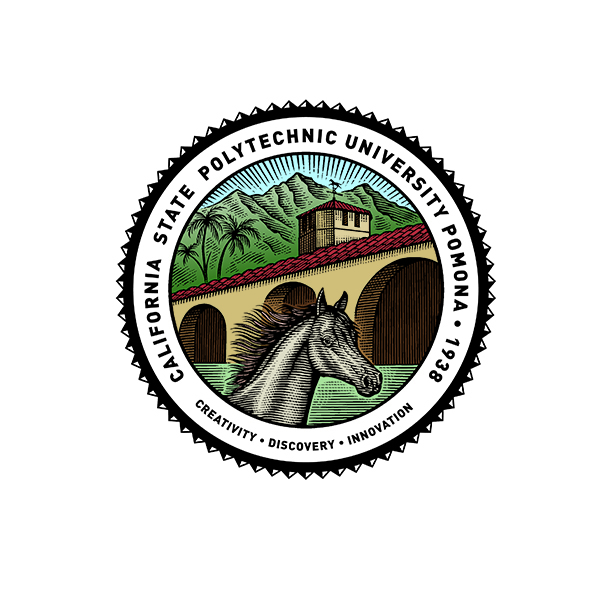 The Cal Poly Pomona brand is one of our most important assets. It symbolizes our spirit, energy and leadership in higher education. At Cal Poly Pomona, we have a unique approach to education and a compelling story to tell. We want our campus community, our alumni and the general public to view us as we see ourselves: a bold leader and an innovator. A strong brand identity represents our vision, spirit, energy and leadership in cultivating student success and transforming lives. Others can copy what we do. They can copy what we say. But they cannot be who we are. The octagon reflects not only the eight elements of an inclusive polytechnic education, the arrow portion conveys that we are a campus on the move. The wordmark, CalPoly Pomona, underscores our deep connection with our namesake city. We also adopted a bold blue to go with our traditional green and gold. The seal pays homage to our unique history. The Arabian horse was inspired by Antez, one of W.K. Kellogg’s favorites. The stables honor the past and are prominent today as the home to our student life offices. And the palm trees and San Gabriel Mountains highlight our Southern California roots. Cal Poly Pomona Intercollegiate Athletics unveiled a new visual identity in 2014. It features a sleek Bronco on the primary logo, and a secondary logo with a stylized CPP. Both marks remain integral to the university.